On July 1, a vague mix of optimism and pessimism filled many workplaces in South Korea upon the effectuation of the 52-hour workweek. Local media have been loudly playing along to the tunes of the government or businesses, either highlighting the newfound leisurely life with shortened work hours, or on gloomy forecasts of the managerial nightmare and even an impairment to productivity. The Moon Jae-in administration has set out to expunge Korea’s notoriety as one of the most overworked countries in the world, by pushing through the debated revision of the Labor Standards Act. South Koreans, who as of 2017, worked 2,069 hours a year in average, would now be protected by the law to work no more than 40 hours a week with 12 additional overtime hours, weekends included. Overtime work would be rewarded with an additional pay rate of 50 to 100 percent. Under the new rule, a strict penalty will follow a violator, with a maximum two years’ imprisonment or a fine of 20 million won ($17,900). Banter over the absurdity, or urgency, of the change has been exchanged among workers and business partners, sharing how each of their companies has prepared to avoid breaking the rules. Many businesses let their employees know they can now enjoy flexible work hours, while some sent out statements seeking a longer grace period to implement the new limits. A week into the change, employees, despite lasting skepticism, are growing more hopeful, as they watch their superiors succumb to the realization that they must now accept that things have changed. They are now defended by the law to confidently shut down the laptop at 6 p.m. sharp, without side-eyeing the boss’ desk. Company dinners have become rarer as human resources departments suggest that while such gatherings are technically not counted toward work hours, it would be best to avoid them in the first place. If things go as planned, leaving work at 5 p.m. would even become fascinatingly common. But things are more complex for some others. Depending on the industry, be it construction or research and development or others, time restraints and production demands are expected to clash. Even though some companies have introduced the “PC off” system of switching off central electricity at a certain time, mountains of remaining paperwork is taken home -- without recognition of it being overtime work. For some, shorter work hours translate into smaller paychecks, which may lead to even longer working hours down the road by having to take up second or third jobs. For managers, there is no clear definition of what constitutes “work,” except for the elusive state guidelines released in November that describes working hours as when: (1) it involves an order from the superior; (2) there is an intention to accomplish a performance; (3) there is a penalty when one refuses to participate; and (4) there are certain time and venue constraints to complete. But one thing is clear in that whether the market was ready or not, the 52-hour workweek has begun with a bang. The public is split between whether it is a totalitarian policy fallacy bordering on socialism, or if without such stringent legislative enforcement heteronomous Koreans would never change voluntarily. Such debate may be inevitable with the law of scarcity, where economic resources are limited compared to unlimited wants. Businesses pivot on creating maximum results with minimum costs while politicians work to adjust interests for what they believe is the greater good -- or to keep themselves in power. Laws have emerged as the solution to reducing work hours in advanced nations like France as well, enabling negotiations between employer and employee. Laws have worked on the function of threat, as noted by Garrett Barden and Tim Murphy in the book “Law and Justice in Community,” posing undesired consequences to those found in noncompliance. After all, if legal scholar Alain Supiot is right, the law connects our infinite mental universe with our finite physical existence and in so doing fulfills the anthropological function of instituting us as rational beings. But with changes and law come resistance and expedient gimmicks. The confusion in Korea following the latest rule may be from the radical speed of its implementation, as Korea’s rate of working hours reduction has ranked third among Organization for Economic Cooperation and Development member countries, according to a National Assembly report. But perhaps a proactive change within workplaces may have saved us the consuming debate, and perhaps the economy will stop measuring labor productivity by hours put in at work. While it has been long since the emerging generation recognized the common sense of differentiating between empty long hours at work and effective crunch time, perhaps the upper brass failed to catch on. Relying solely on the law would be finite without a greater application of common sense. 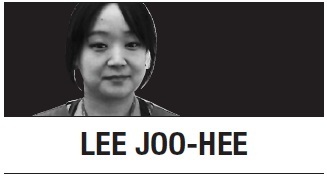 Lee Joo-hee is the business editor at The Korea Herald. She can be reached at jhl@heraldcorp.com. -- Ed.